Coach Barry Trotz has a triumphant return to Washington as the Isles top the Capitals. WASHINGTON — Barry Trotz waved to the adoring fans at Capital One Arena as they stood to applaud him, saluted the Capitals’ bench (with Alex Ovechkin leaning over to ask how he liked the video tribute) and then touched his heart during the first-period appreciation of his four seasons in Washington, culminating with the Stanley Cup celebration last June. Then the Islanders put on a defensive clinic — keeping the shots to the outside and limiting the rebounds as a real homage to Trotz’s coaching skills — and beat Washington, 2-0, on Friday night to vault over the Capitals and into the Metropolitan Division lead. 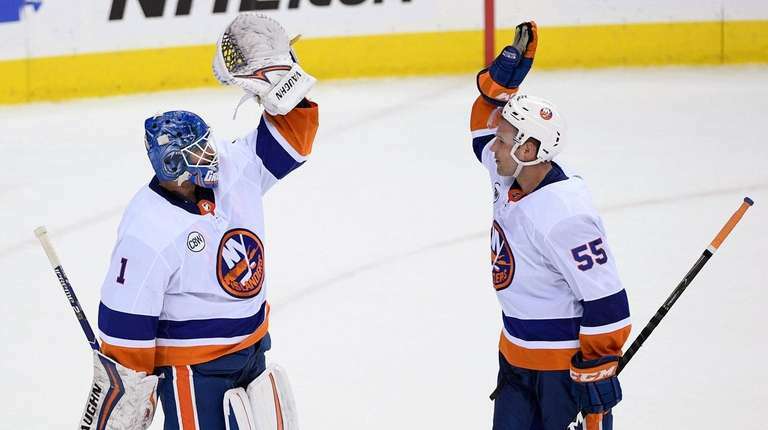 The Islanders received third-period goals by Josh Bailey and Cal Clutterbuck and 19 saves from Thomas Greiss, who notched his second shutout of the season and 10th of his career. Coupled with the Blue Jackets’ 4-1 loss to the visiting Canadiens, the Islanders are a point ahead of Columbus and Washington. The Islanders (28-15-4) have won four straight and 14 of 17 and are 7-0-0 in the second game of back-to-back sets after Thursday night’s 4-1 win over the Devils at NYCB Live’s Nassau Coliseum. This marks only the second time since 1990-91 that the Islanders have been in first place past the halfway mark. According to Islanders statistician Eric Hornick, they have not been in first place this late in the season since March 10, 2015. Trotz said being in first place with 35 games left is “fleeting,” especially for an organization that hasn’t made the playoffs since 2016. But the players knew how much this game meant to Trotz as well as associate coach Lane Lambert and director of goaltending Mitch Korn, who followed Trotz from Washington. Braden Holtby stopped 23 shots for the Capitals (27-15-5). Among his nine second-period saves was stuffing Bailey and denying Brock Nelson’s breakaway with 10.4 seconds to go. The Islanders hired Trotz on June 20, three days after he resigned from the Capitals as the two sides couldn’t agree on a new contract. The video tribute and the subsequent additional acknowledgment of Lambert and Korn came at 6:19 of the first period. Trotz said the day was more about being able to say thank you and goodbye to the arena personnel he did not get to speak to after leaving the Capitals.